Made to measure in our workshops, an elegant canopy can reflect your business’ or institution’s distinctive corporate image. A covering over the length of your entrance way will protect your clients and customers from precipitation while reducing the amount of ice and snow to be cleared away in winter. Take advantage of its visibility to display your company name or logo or to advertise your products. Our advisors can help you with choosing colours, patterns and dimensions. Take shelter from inclement weather under this versatile portico. Its solid, durable 22-ounce vinyl fabric covering prevents snow and ice from accumulating. The removable side curtains stop cold air from blowing in through an open door, with substantial savings in heating costs. Our advisors will help you choose the right colours, patterns and dimensions. They will willingly make an onsite visit, if necessary, to help you design your portico. 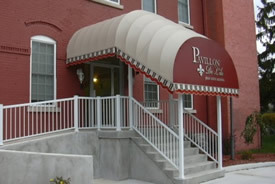 An entrance stairway canopy adds a touch of comfort and distinction to your residence. Its welded Galvalume metal structure has a triple protective coating for corrosion resistance. 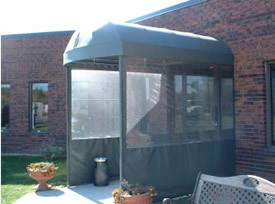 Your canopy comes with a five-year guarantee, so you will be satisfied with your investment for many years. 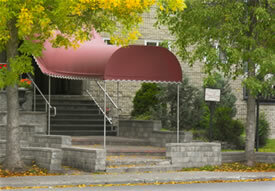 Among its other advantages, a stairway canopy will protect you from precipitation. The tough, long-lasting 22-ounce vinyl fabric covering reduces the amount of snow and ice you have to shovel and clear away. The support posts can be dressed up with fabric in the same or complementary colour of the awning itself to add more elegance to its overall look.